Today on the tour, we had two nice guests, Khobe and David, and Khobe runs a great jewelry studio in California. As huge fans of Czech jewelry, we thought we could share some tips with Khobe, David and with you all. Just like Czech glass, Czech jewelry’s always been sought after. The tradition is really long and almost any traveller visiting Prague knows about garnets and amber. We admit garnet jewelry (please look for stores selling genuine pieces) is very elegant, but if your exploration of Czech jewelry stops there, you’ll be missing out. The growth of modern Czech design is apparent, and young Czech jewelers creating unusual, award-wining designs, shine with special brightness. Let’s have a look at some of our favorites (clicking on the title takes you to designers' websites detailing where you can buy their jewelry in Prague). The Zorya label, the result of fruitful cooperation between jewelry maker Zdeněk Vacek and designer Daniel Pošta, has already made its mark since its inception in 2011. The winners of the Designblok '11 Editors Award for the best collection of jewelry create high-quality, hand-made pieces that are unusual, yet elegant. The popular designer transforms dreams, fantasies, and visions into the form of wearable jewelry. Věra Nováková uses traditional techniques and materials, but chooses less traditional procedures to produce comfortable, wearable pieces. As the designer, Markéta Dlouhá-Marová admits, her pieces occupy the space somewhere between punk and luxury. The designer hand picks river pearls and combines them with precious metals to create visually startling creations. You can see that the person behind the simple geometric creations is an architect. Jana Hamrová uses the minimalist approach to jewelry making. Her preferred material is silver, at times combined with less precious materials such as plastics. This family run business collaborates with many young Czech designers to create an extensive portfolio of jewelry with prices ranging from very reasonable to… well, less reasonable. They use silver and gold, but also titanium, steel and plastics. We also like their little, cool showroom at Mikulandská Street near the National Theater. Jewelry by this Serbian-born designer is extravagant and bold. Inspired by her wild dreams, the creations often borrow from the world of animals. Her last collection, Superpowers, earned her a nomination for the Czech Grand Design award in the jewelry category. Together with another great young designer Nastassia Aleinikava, they created the praised Lure collection. Inspired by organic and inorganic structures, Markéta Richterová creates hi-tech jewelry from materials like corian, perpex or carbon. Although her creations have a precise, industrial feel, each piece is hand-made with lots of handcraft. Joining forces with fellow designer Zbyněk Krulich, she crated the Blueberries line of jewelry made entirely on a 3D printer. Both her collections were nominated for the Czech Grand Design award in the jewelry category. One half of the Belka fashion label, Martina Malá also creates highly ornamented jewelry designs. Her pieces are very colorful and feminine. We love paper. We love paper so much we are sometimes sad that most of our communication is done electronically these days. However, this small obstacle does not prevent us from researching and visiting paper and stationery shops whenever we travel and from browsing their shelves in search of paper and envelopes of various shapes and colors and of stationery ornamented with great typography. If you are like us, this post is for you. While there are several producers and shops that might be of interest to you and us, today we are going to write about Papelote. 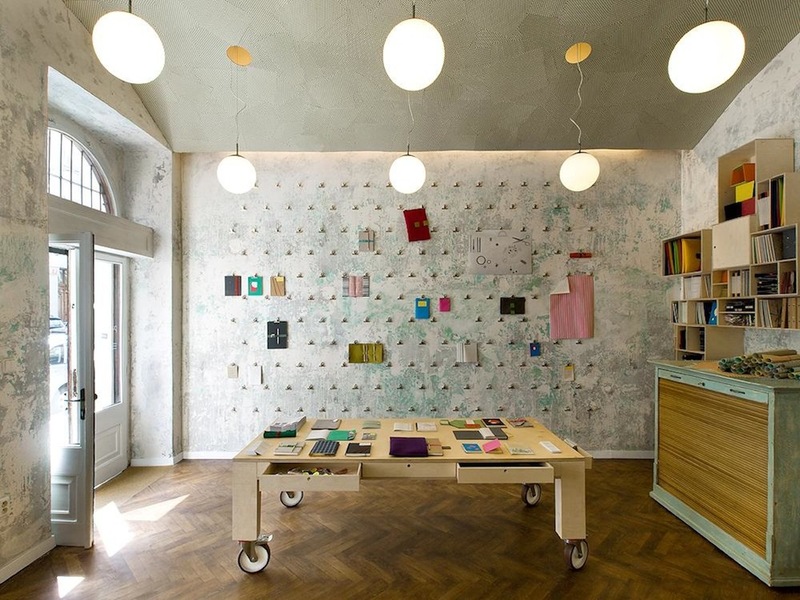 Started by three young designers, the shop has been around for a few years only but already managed to become the 2011 Shop of the Year according to the Czech Design Awards (the fact that it was designed by the famous A1 Architects studio might have helped). Although the shop is not really big, you can easily spend hours looking at, and feeling, diaries of various shapes, envelopes of all the colors of the rainbow, clever paper packages, and designer postcards; all made from environmentally friendly materials. In addition to original paper and stationery, Papelote produces and sells really smart iPad and iPhone covers made of felt (we have one, and several of our guests have asked about it). They also have a small collection of books from Czech publisher Baobab and books featuring different illustrators and printmakers. In addition to this shop, they also operate Pape.lab, a workshop studio thatoffers its services to basically anyone who is interested in paper, design and originality. Want a souvenir from Prague? You don't have to hull around a big crystal vase! A nice diary or a simple postcard fits anywhere, and will bring back many memories. We know this works for us, and we think it could work for you, too! Btw if you visit the shop, you'll probably find one of the founders behind the counter.